A Worldwide Manufacturer of high quality, technologically advanced material handling & electronic components. 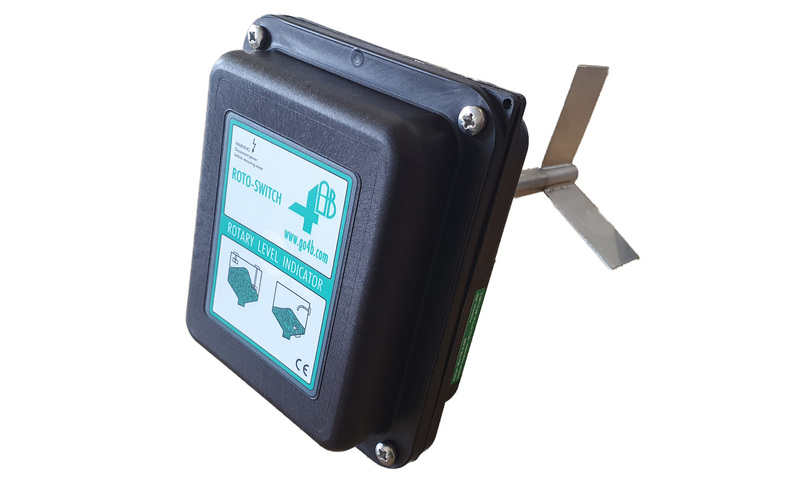 The RLI rotary paddle switch is designed to detect high and low levels of bulk granular solids in bins, tanks, silos, and as blockage detectors in spouts. The detection of material is achieved by a rotating paddle. If material impedes the rotation of the paddle, the motor topples of its axis and triggers a contact. The power supply to the motor is cut and the contact signals that a critical level has been reached, which will cause the motor for any inlet or outlet to close down or start up. When the level of the material reaches normal levels again, the motor returns to its initial position and restarts. Need advice to make your bucket elevator safe? Click here to get a free recommendation. Mild steel powder coated mounting flange with 11/4-inch NPT or 1 inch BSP, half or full coupling. Ensures a solid fixing to tanks silos and bins. Suitable for Binswitches, Rotosafes, Autoset . Supplied complete with weather gasket. (Also available in stainless steel). The RLISP1 is designed for heavy materials over 70 lbs/ ft³ (coal, stone, etc. ), while the RLISP2 is designed for medium materials between 30 to 70 lbs/ ft³ (powders, light grain, seed, etc.). The RLISP3 (5 inch diameter) is designed for medium materials between 30 to 70 lbs/ ft³ (grain, beans, oil seeds, etc.). The RLISP4 (7 inch diameter) is designed for light materials under 30 lbs/ ft³ (flour and light materials). The X400 Elite is a microprocessor controlled low cost alarm indicator panel for use with level indicators, hazard controls and limit switch sensors. The X400 accepts signals from different sources in up to 8 zones, and is able to cause alarm and shutdown of the machine when an alarm condition has been detected. Alarm and status LEDs on the lid of the X400 provide quick location of alarm conditions. Alarm muting can be performed at the panel or by an optional remote push button to silence external alarms. Can the RLI be side or top mounted? Yes, it can be either top or sided mounted. Preventative maintenance can help reduce the risk of equipment failure and consequent downtimes. When it comes to monitoring your bucket elevators and belt conveyors, 4B can recommend you the ideal combination of sensors and monitoring systems to suit your requirements and budget. 4B provides an extensive range of their own ATEX / IECEx / CSA /GOST- R approved hazard monitoring systems, misalignment switches and bearing temperature monitors and level controls. We can offer you anything from a replacement sensor to a fully integrated hazard monitoring system which can be operated either as a stand-alone system or connected to your PLC. And if you do not want to install hazard monitoring sensors on every piece of equipment in your plant straightaway, we can offer you a scalable solution starting with carefully chosen equipment and systems that can be expanded at a later date to encompass other machines in the plant. We can also offer you an installation service, and we do provide a competent after-sales technical service to help you overcome any technical problems with your monitoring equipment. To get a recommendation from our engineers, please fill in the electronics questionnaire below. Please fill this form in as accurately as possible to allow us to deal with your enquiry more effectively. If you would like to send us a technical drawing or document with your enquiry, please send to 4b-uk@go4b.com. We'd love to send you our newsletter and occasional product updates by email. We'll always will treat your personal information with utmost care and will never sell them on to other companies for marketing purposes.